This gentle formula helps to promote a feeling of calm and well-being that all dogs (and their owners! ), will appreciate. Great for pets that are bothered by a change in routine or that get over-excited as well as those fearful of fireworks/ travel. With key B vitamins renowned for their nervous system support, Magnesium for optimal muscle and nerve function. Also includes extracts of passionflower and lemon balm, two well-known relaxing herbs, L-Tryptophan, an essential amino acid for its calming properties. This formula really is designed to meet the needs of all sizes of dogs. Calcium Carbonate, Microcrystalline cellulose, Yeast, Beef and Liver Flavour, Silicon dioxide, Stearic Acid, Magnesium Stearate. 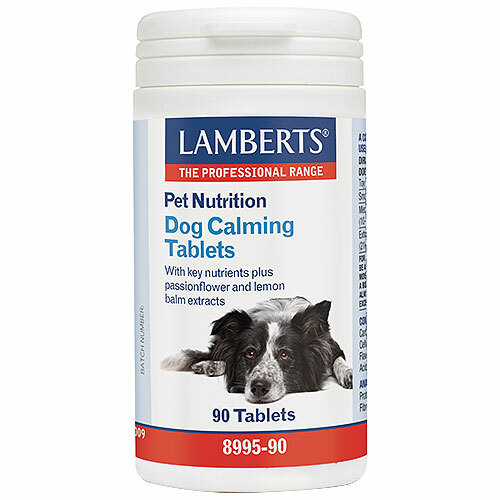 Below are reviews of LAMBERTS Dog Calming Tablets - 90 Tablets by bodykind customers. If you have tried this product we'd love to hear what you think so please leave a review.